Singing Palette Help to Use - How can Singing Palette ensure the safety of my works if I send it to you for exhibition, for example, keeping it from missing or being damaged? Are there any hidden fees since the Singing Palette claims not to charge anything for their service? Who will buy my works through the platform of Singing Palette? Why do I bother to submit my works to the Singing Palette instead of putting them on my own personal website? How can I display my works on Singing Palette? Why my account was declined? Why the works I submitted are not displayed online? Why that I have not received any collecting consultation after I have submitted several pieces of my works for a long time? Why my works were declined after they have passed the verification for a while? The copyright of the works is under the law of which country? How can Singing Palette ensure the safety of my works if I send it to you for exhibition, for example, keeping it from missing or being damaged? Why do we need to cooperate with Singing Palette? Why do we need to submit the works by our principle artists to Singing Palette instead of displaying them on our own website? How to cooperate with Singing Palette? How do we distribute the exhibition fees with Singing Palette and your partners? How can I collect works through your platform? No query results? Please submit them online to Singing Palette. 》 How can Singing Palette ensure the safety of my works if I send it to you for exhibition, for example, keeping it from missing or being damaged? Singing Palette will sign an exhibition agreement with you for the works you send us. 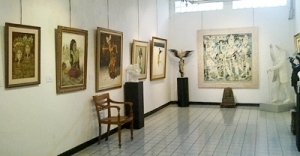 Both the parties will purchase insurance together as applicants for your works and the insurance fee will be distributed by the two parties according to the nature of the exhibition.